Both older and newer homes can lose a significant amount of air every year from leaks in the attic and other parts of the building. Whether you just bought a house, or you lived in the same house for years, it’s important that you take the time to look for leaks. Most leaks occur around the openings, including the doors and windows, but leaks may also arise due to poor insulation or a lack of insulation in a room. Air sealing your home can result in lower energy bills and increase the comfort of your home. Air sealing is a method used by professionals to reduce the leaks in a home. There are a number of products that those companies can use and some products that you may use on your own. Expanding spray foam and caulk fills in gaps inside walls and ceilings. Though both products go on smoothly, caulk will dry in place. 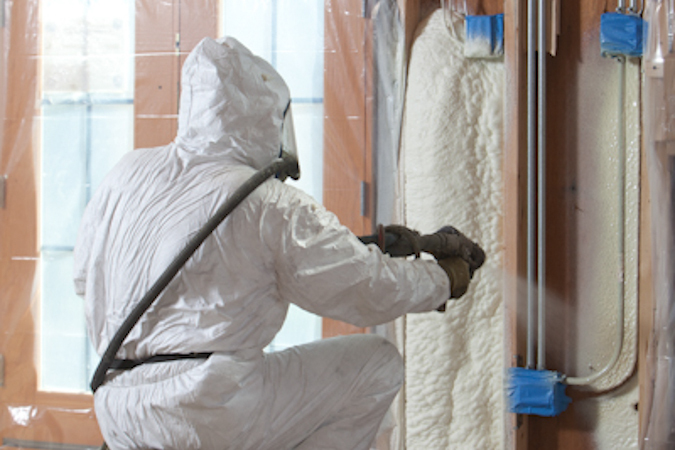 Expanding spray foam expands to fill in the gaps. Weatherstripping is another method that you can use. These strips come in small and large rolls that you can cut into pieces to fit the space needed. Adhesive on the back holds the strips down. Weatherstripping is suitable for doors and windows. The cost of air sealing your home depends on whether you do the job yourself or hire a professional. Weatherstripping, caulk and expanding spray foam is generally inexpensive, but you may find that professional can fully seal your home better than you could on your own. A professional audit can cost a few hundred dollars or more, but this audit shows you exactly where you lose air and what you can do to prevent leaks and will save you money in the long run. Those drafts that you feel spreading throughout your house can add a large amount to your natural gas and electric bills. Heat can easily escape through those leaks, and when you use your air conditioner, that cold air can instantly leave your home. Sealing you home against leaks, along with proper insulation levels, can save you up to 20% or more on your heating and cooling bills. To find out more about air sealing your home to prevent leaks and bring down your heating and cooling costs, contact USI online to get a free quote. USI believes that excellence in every step of the process ensures timely completion and quality service, time after time. ← Which Types of Insulation Help Reduce Noise?